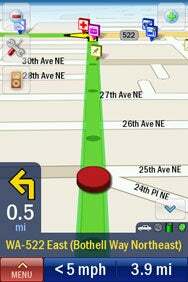 Your options for U.S. turn-by-turn driving directions on the iPhone got a lot more interesting on Tuesday. No doubt responding to recent pressure from Google’s free turn-by-turn directions on Android, CoPilot now offers its U.S. navigation app on sale for $5, and Skobbler’s US version is now free. CoPilot Live USA is a modified version of ALK Technolgoies’s North America app of the same name, which sells for $20. This new version still packs a lot of the features of its big brother, like turn-by-turn voice-guided directions, offline navigation, Lane Assist, route optimization, and lots of iPhone integration. To push CoPilot Live USA to its $5 price, though, ALK Technologies stripped out two key features and made them in-app upgrades: Live Traffic Alerts and the Live Fuel Prices subscription. If free is more your flavor, Skobbler US offers turn-by-turn voice navigation and a healthy dose of features like integrated iPod controls, automatic continuation after calls, and take-me-home functionality. It does not, however, include offline navigation, so you will need a continuous 3G connection to get around. On the bright side, Skobbler US is just a 2.3MB 3G-friendly download since it does not include all that map data. By comparison, CoPilot Live USA (like many other navigation apps), is a whopping 1.3GB. Both apps require iPhone OS 3.0 or later and are available now in the App Store.